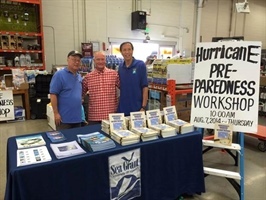 In 2007, Dennis Hwang and Darren K. Okimoto of the University of Hawai'i Sea Grant College Program (Hawai‘i Sea Grant) co-authored the Homeowner's Handbook to Prepare for Natural Hazards for communities throughout the state of Hawai‘i. The handbook was written specifically for the homeowner and is based on three main principles: 1) easy to understand and applicable to homeowners, with pictures and step-by-step instructions; (2) educate and inform the homeowner of hazard risks in their area; and (3) offer as many options or solutions to the homeowner as possible that are relevant, reasonable, and cost effective, even providing viable do-it-yourself options for homeowners after consulting with a licensed professional. The handbook synthesizes the most useful and current information and makes it easily accessible. Since 2007, Hawai'i Sea Grant’s handbook has gone through three versions with over 75,000 copies distributed, and the electronic version is also freely accessible through multiple online sources. In 2016, the fourth edition of the handbook will be published with updated information on hurricane and tsunami risk. 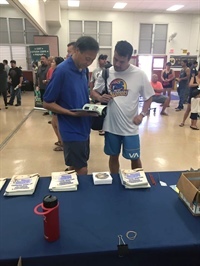 Hawai'i Sea Grant's Dennis Hwang and Darren K. Okimoto at an outreach event. Image: Hawai'i Sea Grant. To date, the handbook has been produced or adapted by nine Sea Grant programs nationally, providing critical information and assistance to homeowners in eight states and two U.S. territories. Seven of the handbooks have been supported by the NOAA Sea Grant Coastal Storms Program under the direction of Coastal Storms Program coordinators, Tracie Sempier of the Mississippi-Alabama Sea Grant Consortium and Dolan Eversole of Hawai‘i Sea Grant. Two of the newest versions of the handbook were adapted for the Republic of the Marshall Islands, in a project led by the College of the Marshall Islands, and the Commonwealth of the Northern Mariana Islands, produced by the Guam Sea Grant. Both of these handbooks were funded by the NOAA Sea Grant Coastal Storms Program. Hawai'i Sea Grant's Dennis Hwang at an outreach event. Image: Hawai'i Sea Grant. Key contributors for the handbooks include Steve Sempier, Jody Thompson, and Melissa Schneider (Mississippi-Alabama Sea Grant Consortium); Jim Wilkins, Melissa Trosclair Daigle, Lauren Land, Roy Kron and Paula Ouder (Louisiana Sea Grant); Cindie Powell and John Jacob (Texas Sea Grant); Libby Carnahan (Florida Sea Grant); Wendy Carey (Delaware Sea Grant); Greg Berman and Juliet Simpson (MIT Sea Grant); and Karl Fellenius, Cindy Knapman, and Heather Dudock (Hawai‘i Sea Grant). Partners for the various handbooks include the Federal Emergency Management Agency Building Science Branch, NOAA National Weather Service, the American Red Cross, and many emergency management or civil defense agencies at the State and local level. Private partners include Simpson Strong-Tie, State Farm, the Institute for Business and Home Safety, Walmart, and many banks and insurance companies. Access state Sea Grant handbooks for Alabama, the Commonwealth of the Northern Mariana Islands, Delaware, Florida, Hawai'i, Louisiana, Massachusetts, Mississippi, the Republic of the Marshall Islands, and Texas.